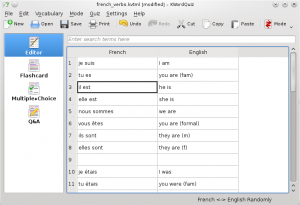 KWordQuiz is the KDE version of the Windows program WordQuiz. If you have just switched to KDE/Linux you can use all files created in WordQuiz with KWordQuiz. This page was last modified on 10 October 2010, at 07:29. Content is available under Creative Commons License SA 4.0 unless otherwise noted.